Just so that you aware, we are planning to conduct electrical testing within our practice on Thursday 28 March 15:00 -16:00 as part of the maintenance of the surgery. CQC’s new programme of inspections of England based GP practices focuses on rating according to whether they are safe, effective, caring, responsive and well led. Inspectors rated Somers Town Medical Centre “Good” for being well led and responsive to people’s needs. Professor Steve Field, Chief Inspector of General Practice said “We carried out an announced comprehensive inspection at Somers Town Medical Centre on 11 September 2018 as part of our inspection programme. The practice had clear systems to manage risk so that safety incidents were less likely to happen. When incidents did happen, the practice learned from them and improved its processes. The practice routinely reviewed the effectiveness and appropriateness of the care it provided. It ensured that care and treatment was delivered according to evidence-based guidelines. Feedback from patient interviews and CQC comment cards was positive about the way staff treated them. Patient feedback indicated that people sometimes found it difficult to gain access to the practice by telephone, although they were usually able to get an appointment when they did get through. The provider’s patient list included a large cohort of Bengali patients and in response full time Bengali interpreters were based at the practice. Please note that there are essential maintenance works being carried out this afternoon at Kings Cross Surgery, which will cause us to lose power in the surgery briefly. You will be unable to contact the surgery by telephone between 1.30pm-2.00pm. We will also be running a limited service during this time and aim to resume to normal service shortly after 2.00pm. Thank you for your understanding. If you or someone else experiences severe chest pain, loss of blood or suspected broken bones, or any other life threatening illness go to your nearest accident and emergency department or call 999. *Service ran by locality hub. *service by locality hub for patients of Somers Town Medical Centre and other Camden GP Practices. **6.30pm – 8.00pm service by locality hub for patients of Somers Town Medical Centre and other Camden GP Practices. on Weekdays from 6.30pm to 8.00pm and on Weekends from 8.00am to 8.00pm. Camden GP Hubs are staffed by experienced GPs and Nurses and offer assessment and treatment for adults and children with minor injuries and illnesses. You can self-refer by calling the Patient Booking Line (08:00–20:00): 020 7391 9979 or using the Patient Online Booking Service. 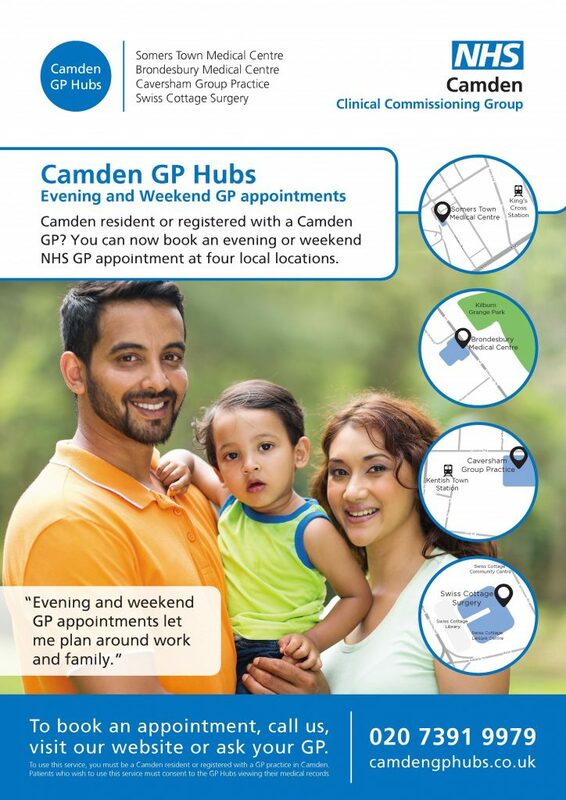 To use this service you must be a Camden resident or registered with a GP practice in Camden. Patients who wish to use this service must consent to the GP Hubs viewing their medical records. If you are feeling unhappy or worried these short films will help you understand what support is available and where to find it. Available in Somali, Urdu and Bengali/Sylheti with English subtitles.